$Signed a four-year, $24.96 million contract with the Cowboys in May of 2016. Cowboys exercised $9.1 million team option for 2020 in April of 2019. The decision to pick up the $9.1 million option was an easy one for the Cowboys, as the 23-year-old has established himself as one of the NFL's few three-down bellcows since entering the league in 2016. The option may end up serving merely as a placeholder while Elliott and the Cowboys turn their attention to working out a long-term extension that will keep the Ohio State product in Dallas for the duration of his prime. How do Ezekiel Elliott's 2018 advanced stats compare to other running backs? See where Ezekiel Elliott lined up on the field and how he performed at each spot. 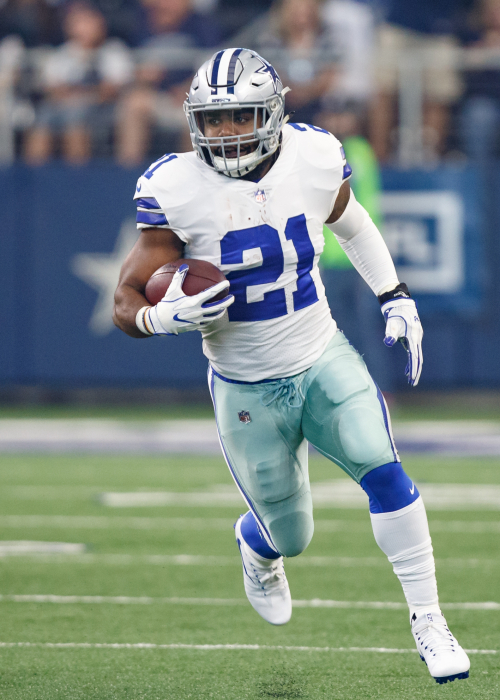 How do Ezekiel Elliott's measurables compare to other running backs? Elliott hit the jackpot in the 2016 draft, landing with a Cowboys squad that was perfectly set up for an every-down back to come in and put up huge numbers behind their dominant offensive line. The 6-0, 225-pound dynamo out of Ohio State more than held up his end of that bargain, teasing a run at Eric Dickerson's 1983 record for rushing yards by a rookie before eventually settling for his first of what could be many rushing crowns. Elliott combined elite vision and plus elusiveness with the burst to break into the second level and the speed to run away from defenders once he got there. Perhaps the most valuable weapon in his arsenal is his uncanny patience, as he demonstrated the ability to wait for plays to develop and his blocks to get set up before attacking the hole. Depressingly for opposition defenses, Elliott may just be scratching the surface of his potential. He wasn't as involved in the passing game as he could have been, something that should change as Dak Prescott develops right alongside him, as Elliott was charged with only one drop last year. The Dallas O-line may take a small step back this season after losing two starters in the offseason, but the real concern surfaced in mid-August when Elliott was handed a six-game suspension. He was granted an injunction and temporary restraining order that allow him to keep playing for the Cowboys while his lawsuit plays out in court, but there is a small chance he could miss time later in the season if the case is wraps up quicker than expected. Elliott ran through, around and over collegiate defenses the last two years, collecting 41 touchdowns and 4,125 yards from scrimmage. As dominant as Elliott was in the Big 10, he was even better during three career Bowl games: 83 carries, 625 yards, 10 touchdowns, 7.5 a carry. Not too shabby for someone who finished eighth in the Heisman voting as a junior; maybe they should run that election after the season is over. He showed the ability to play on all downs and in all packages, making him an unusually polished running back entering his freshman season in the NFL The Pokes snagged him with the fourth overall pick in May. You can have a long discussion about who should go No. 2 in a rookies-only draft, but Elliott is going to be the obvious No. 1 dynasty league pick everywhere — mostly because of his talent, but it also speaks to an unexciting crop of rookies. With that in mind, the isolation of Elliott is only going to make him more expensive in most pools. Ah, but there's plenty to like. The Cowboys still have the consensus No. 1 offensive line (it graded first in both run and pass blocking last year, per Pro Football Focus), and Dallas has a paper-thin schedule.The window to win is narrow in Dallas, given the age of the key core — and with that, it's unlikely the Cowboys will make Elliott wait to prove much.